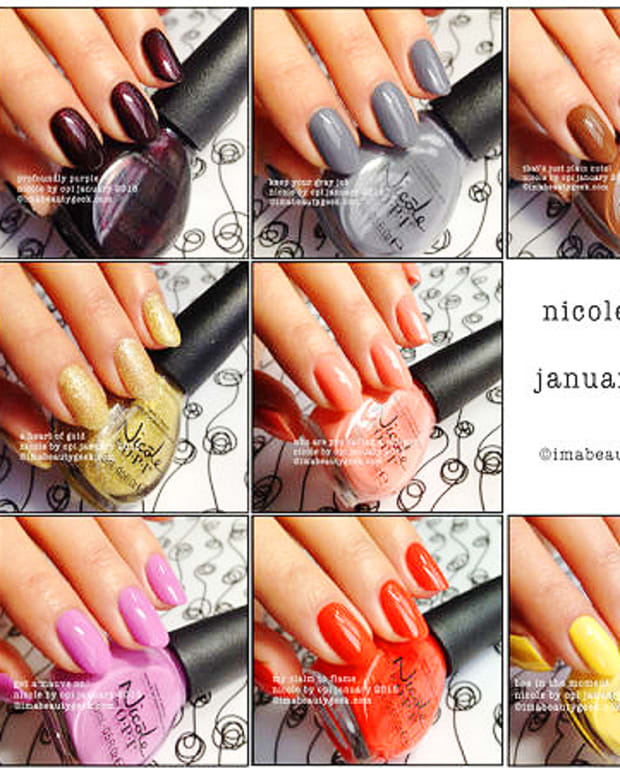 The Nicole by OPI fall 2014 offering is a lovely little collection that transitions into the season gently. With three crème shades plus a delightful holo-glitter topper, it’s happy polish times at the Mani-Geek desk. There’s something to be said for a small, cohesive set of polishes. I much prefer them to giant collections ’cause when you look at ’em as a whole, everything just feels like it goes together. I like it when things go together! 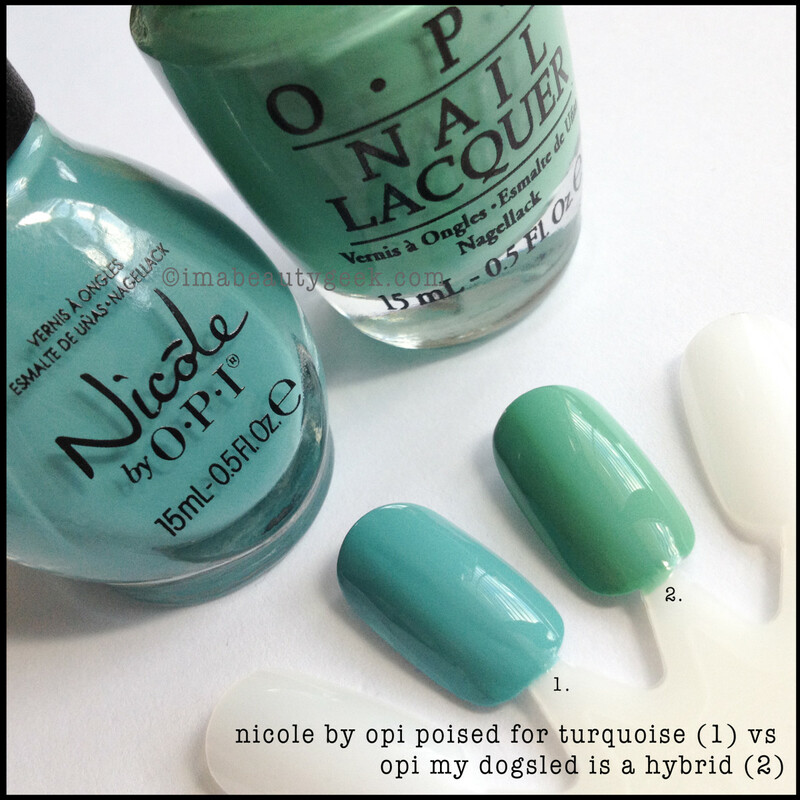 above: nicole by opi poised for turquoise That’s three thin coats to get what you see there. It can probably be done in two thicker ones but you know I can’t help but skim-coat - it&apos;s how I do (yes, even when I’m drywallin’, yo). 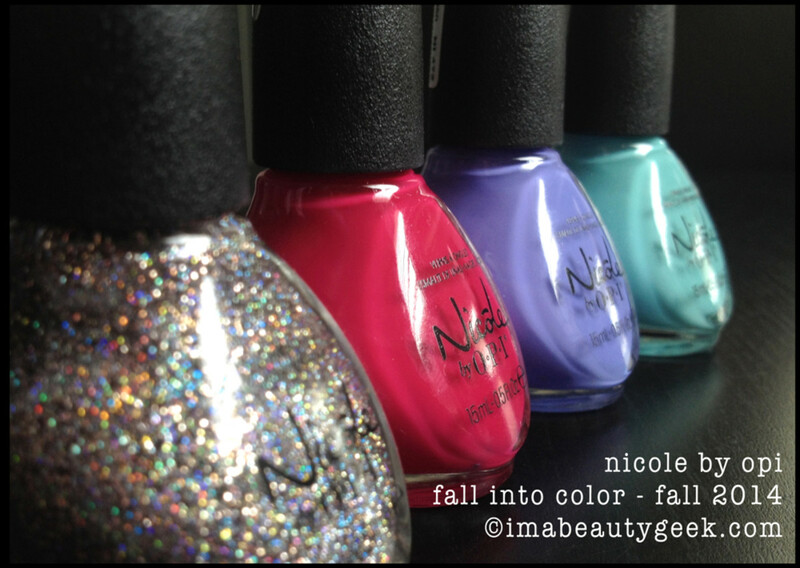 above: nicole by opi did he wink at me? Oh! I kinda love this shade of cornflower purple? Periwinkle purple? I don’t quite know what to call it so I’m just gonna call it fabulous. Kinda springy, it’s true but it’ll look so nice with that charcoal grey cable-knit sweater I just pulled out of storage! Also, it’s a *OCW!!!! Yep, that’s one coat. Wheeee!!! above: nicole by opi berry the hatchet I do love a raspberry shade of polish. She looks kinda jelly but she ain’t. What she is, is crème - flawless raspberry crème that goes on in two easy coats. above: nicole by opi dazzling with talent over berry the hatchet Nicole by OPI calls this an iridescent super-shimmer and while I’m not really a particular fan of glitter coats, I quite like this one. Because the clear coat has a tiny bit of a yellow tint, it does tend to deepen the shade underneath but that’s okay – the blue glittery bits go spectacularly well with the blue undertones of the raspberry polish coat underneath. above: nicole by opi dazzling with talent over revlon black magic So I took out my trusty OCW black and dazzled it with some talent and lookit all the glitter colours that pop out! Oh, and that&apos;s with a coat of Nicole by OPI Quick Dry Top Coat over it to smooooth it out some. It&apos;s still a little textured with one coat so if you need the glassy finish, just use more coats of your thickest quick dry topper, yes? above: nicole by opi dazzling with talent over revlon black magic If I get that magical out-of-focus shot (harder than you think when all the dumb camera wants to do is focus), I can pop little rainbowz out of my glitter bits. Kinda splendid, right? And that’s it. That’s all there is. But I think it’s enough. Not over-the-top yet pretty and slightly unexpected for fall. 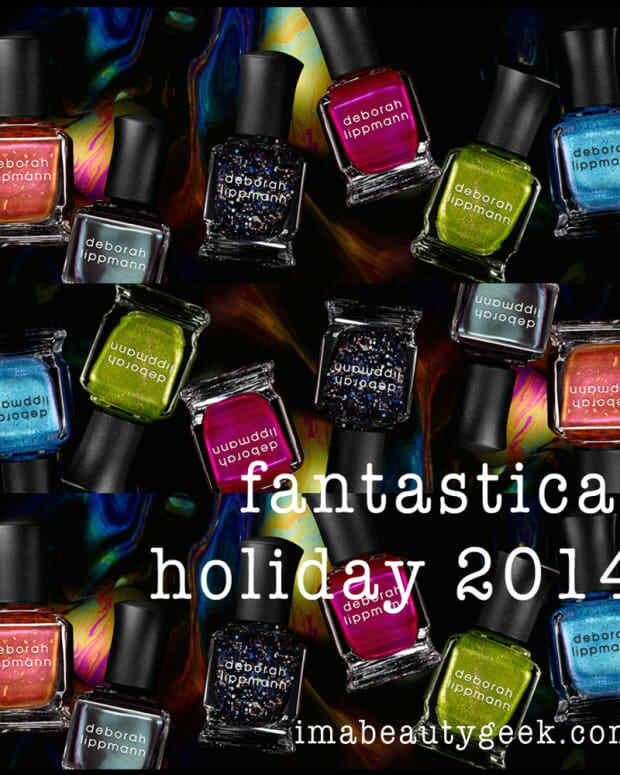 Suzi Weiss-Fischmann says “Vibrant nail colour can offer a unique twist on traditional fall colours making transitioning between seasonal styles much easier”. I say, “thanks for not making yet another blackened burgundy that looks like all the other blackened burgundy shades I already have”. For you, Carly! Hope it helps! *For you, Lisa! 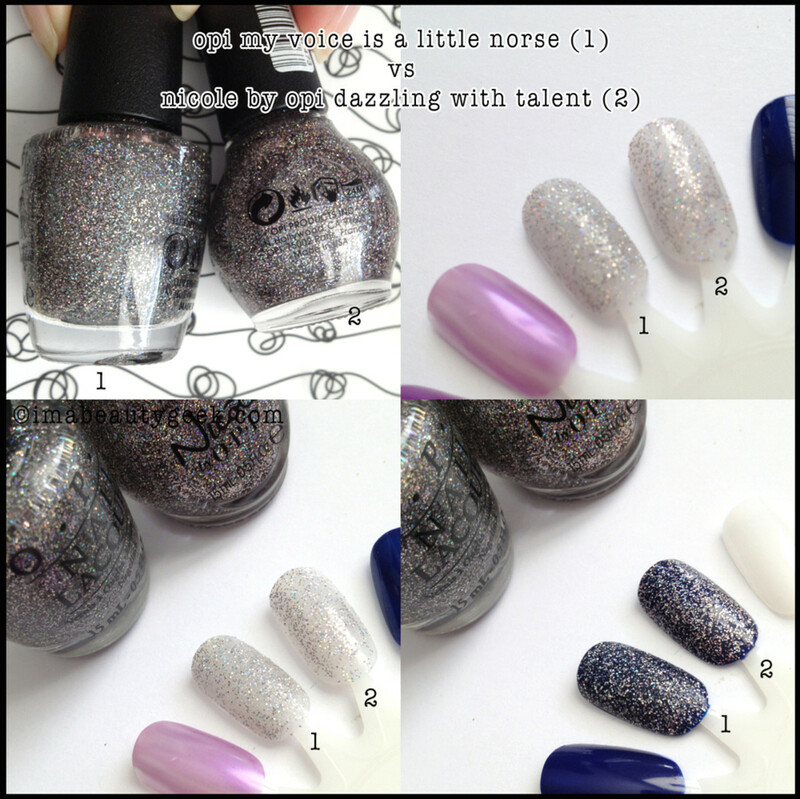 A comparison swatch of OPI My Voice is a Little Norse vs NOPI Dazzling with Talent. In Canada, these four new shades will be available starting September 2014 exclusively at Shoppers Drug Mart ($11 each) and probably all over the place in the US.